Here’s another sweet video from my friends Jonathan and Melisa Helser. These guys are playing here in town next month at the Visulite Theatre. Your last chance for vinyl! If you want one, you have to buy a presale ticket to one of these shows (while supplies last). 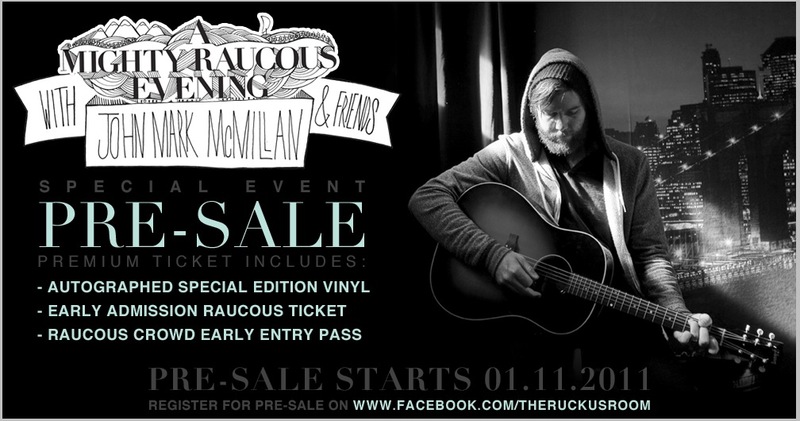 If you want a presale ticket you have to first register the facebook event as “attending”. Tonight some friends stopped by GAT3 studios here in Charlotte where our record is coming swiftly to a close. They came by to sing. Beautiful voices. It felt like Christmas. GAT3 has been an amazing place to work. Sweet people, killer vibe, and over the top gear. But the coolest part is that it’s only 100 yards from the building where I learned how to sing and where I played my first songs. I don’t think it’s a coincidence that I would finish this project here, at a time in my life when I’m struggling to get back to something I once believed in. No matter how far I go, the church at Presly Road will always haunt my dreams. I found something in that building that I will always desire to experience again, and no matter how cynical I’m tempted to become, it will never let me go. I think I’ve come full circle. Round 2. Lets go. What is a “Raucous Evening”? Well, pretty much what it sounds like: A disturbance. In this case mostly loud music. Well… you are my friends. Plus I have some surprises. The point of the tour is to bring together different worlds that we don’t think are so different. Most importantly we don’t want to sing at you, we want to sing with you. Yeah it’s a show, but I think we would all be disappointed if it was just a show. Wink Wink. You know what I mean? We’re purposely playing a lot of small venues, so we expect to sell out most of these shows. A good way to make sure you get a ticket is to register for the pre-sale! kind of like a pre-pre-sale I guess. To register for the pre-sale tickets and get a limited edition autographed vinyl record, just go to the corresponding Facebook Event page and click the “I’m Attending” button. Then on January 19th you will be notified of the option to purchase the premium ticket/vinyl record before the general public. More cities including Texas and West Coast to be added shortly! Note: Ruckus is a noun. Raucous is an adjective. Time to put my game face back on. Tracking resumes in the morning and we only have 2 weeks to wrap up the new album. We’ll finish here in Charlotte, then mix it next month in New York. I’m pleased with all the work we’ve accomplished, and I have tons of faith in my team. Still, I’m not going to lie, I always have to deal with these nagging thoughts in the back of my head. The ones that say “This is it. This is the one that is going to be a total bomb and send you back to waiting tables.” I never just expect that people are going to automatically love what we do. If this seems really insecure it’s because it is. Still, I think this is probably the best place to be right now. The day you have it figured out may be the day you’re done. I certainly don’t have anything figured out. I just know that we are pursuing the sounds that make us feel the way we want to feel, and at no point can we afford to turn on auto pilot. Will this album will be different than the last one? It should be. Right? We’re 3 years older now. We’re listening to different music, and we have different things to say. Plus, as proud as I am of The Medicine, I don’t see any reason to record the same album twice. So what will it sound like? Shoot…I don’t know. I do know that we aren’t trying to make any “singles”. We never have. It’s not like anything we do stands much of a chance on the radio. Besides, they’re all singles in my book. Whatever. The insecurity is raging, but the creativity is “on 11”. I’m nervous but hopeful and can’t wait to leak some of this stuff. So stay tuned. The album rolls out in September. It’s a long time to wait but we will try and release something before this album is totally dated.